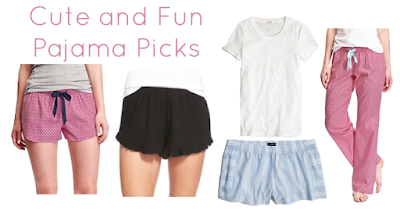 I woke up this morning really wanting to stay in bed all day, but since it's Wednesday and I have to go to school and can't stay in my pajamas I thought it would be fun to share some of my favorites in stores currently! There is nothing better than ending a busy day in a fresh, new pair of pajamas. I think the perfect pair is bright and patterned and all of these fit that perfectly! Plus who can resist a new affordable pair of sleep shorts during the summer! Where is your favorite place to buy pajamas?